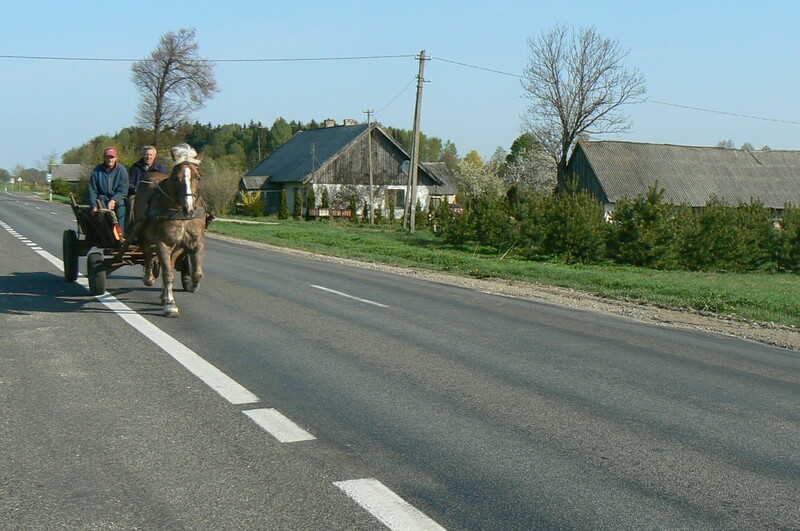 To view my cycling route across Lithuania, click here. To view a detailed personalised map following chapter 2, click here. Fat Ugly Legs and a Stupid Cat. My neighbour works in Dituva and I had planned on visiting him. I swung my bike right into the first minor road and stopped in front of this small traditional outdoor-furniture-factory. I had little idea if this was actually the factory where he worked or if indeed he was there this day, and so ended up spending a long time peering through my sunglasses into the factory’s dark cool interior. Eventually a head popped up followed by a waving hand. I dismounted my bike, took off my helmet and wiped the sweat off my forehead. In Lithuanian culture men must shake hands for every greeting, in winter even if it is minus thirty degrees, a man must take off his glove and greet with a hand shake. Cycle gloves are annoying helpful little things. They provide padding for your hands, thus stopping your hands from aching during the latter stages of long bike-rides. They also stop sunburn and mine even have a little bit of fleecy material for wiping off sweat and snot. But they are infuriatingly, finickitally, difficult to get on and off, and here the dilemma starts. My neighbour strode out of the factory with an ear-to-ear smile and a single outstretched hand. My options were to annoy him by looking like the stupid foreigner and taking five minutes to drag each finger out of those little holes or to offend him by leaving my glove on. On account that he was a Russian Lithuanian, thus much harder to offend and cared a lot less for Lithuanian culture, I choose to leave on my glove. He gave my gloved hand a curious fleeting glance before grabbing it and enthusiastically shaking it, whilst slapping me on the back with his free hand. My neighbour is like so many of the Russians who either couldn’t, or forgot to, go home after the Soviet Union collapsed and who, much to the dismay and anger of ethnic Lithuanians, have either been unmotivated or unable to learn the language. The two of us have had many minus-10-snow-shovelling conversations. They are usually conducted in Russian, Lithuanian, English and the international language of frantically waving one’s arms through the air whilst intelligently grunting. At the end of these conversations I always feel pleasantly uplifted, totally confused and like I have just survived a rigorous aerobics routine. The key is, no matter what you have just heard, keep smiling, they probably didn’t just say that ‘you have fat ugly legs and a stupid cat’. Fat ugly legs and a stupid cat aside, my neighbour and I performed our smiley aerobic routine, then shook hands again, before he disappeared into the bowels of his factory and before I wiped a fresh layer of sweat off my bald head, took a drink, filled up my water bottle and hit the road again. Five minutes down the road somewhere near the Dercekliai turn-off I wildly zoomed past another vehicle, gosh I was fast, the driver and his passenger clearly did not expect to see a fully-laden bicycle, clad with a reflectorised yellow-clothed German shouting, “Guten Morgen”. I shouted my greeting not only because I was afraid of frightening the passengers, but also because I was afraid of spooking their horse. Yes I said horse, this is not some kind of sad attempt at an intellectual metaphor, I actually sped past a horse and cart. This is not an unusual occurrence in Lithuania, hay-burners and drays are quite common here; welcome to the 21st century, the European Union and NATO. ‘Giddyap ya ole nag we have to rush to Brussels and bung some austerity measures on those over-spending Greeks’. These two old geezers were too wasted to realise that the Soviet Union had been traded in for the European Union, they let fly with a certain four letter Russian ‘B’ word that is not to dissimilar to a certain four letter English ‘F’ word. Two drunken Russians being pulled by a horse was definitely worth my first photo-stop. I jumped off my bike at a fortuitously placed bus stop, flipped out my camera and started clicking away. They smiled at the oddity of a cycling loopy German paparazzi photographer and obliged accordingly with many spasibos or in English, many, thank yous. This left them both sounding remarkably like over-humburgered, worn out and wasted Elvises. It is not that unusual here to see someone asleep on the tray of their dray with their horse leading them either home or back to the motherland. Anyhow they were good guys, a little spooked, but good guys. I guess ‘Guten Morgen’ needs a little bit of explanation. You see, there are seemly only two kinds of tourists in this part of the world: one is fat-bellied, drunk and wearing budgie-smugglers and the other is decked out in an excessive amount of synthetic high-performance outdoor gear, wearing thick-rimmed square glasses and trudging the terrain of old-town cafes with smart-phones and SLR’s. The former we call Russian, the latter we call German. The big difference between the two is that generally speaking the Germans are somewhat sober and actually explore beyond the bars and beaches. There is history here; this region was once part of the Germanic Prussian kingdom that loosely lasted from 1701 to 1918. Many of these Germans are actually trying to get in touch with their Prussian roots or rather the Prussian routes that their grandparents took many years ago. Consequentially on these roads we tend to bump into an array of shaky fat-bottomed Germans who in their everyday life usually do not grace the leather of a cycling saddle. I figured that since I looked like a scrawny root and route-searching German, that I may as well live up to the expectation and speak German, hence the ‘Guten Morgen’. My wife is a Prussian-Scottish-Kiwi: it explains her horizontal approach to constantly running late with fastidious rigid time-keeping. Anyhow the bus stop was a good place to call home and inform Sharon that I had forgotten to pack into the car our fish-grills. A fish-grill naturally enough being a fundamental piece of apparatus for barbecuing ribs. More later. Stay tuned for chapter 2.c and learn about Kiwi sheep and Lithuanian cow poo. Are you confused as to what these numbers are ?, they are part of detailed glossary that will be included in the print and eBook version of this story. This entry was posted in Peddling the Dirt by f32dream. Bookmark the permalink.